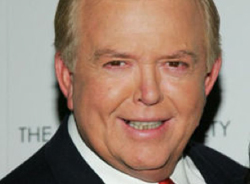 Lou Dobbs will start his new Fox Business show on March 14, the network announced Thursday. The show will be titled “Lou Dobbs Tonight,” and will air at 7 PM Eastern. That just happens to be the same title and time-slot that Dobbs’ CNN show had. Dobbs left CNN in 2009 after mounting tension between him and the network over his increasingly outspoken political views. He announced that he was joining Fox Business in November of last year.